Create a calming indoor zen space with this unique metallic look tabletop water fountain accented with LED candles. 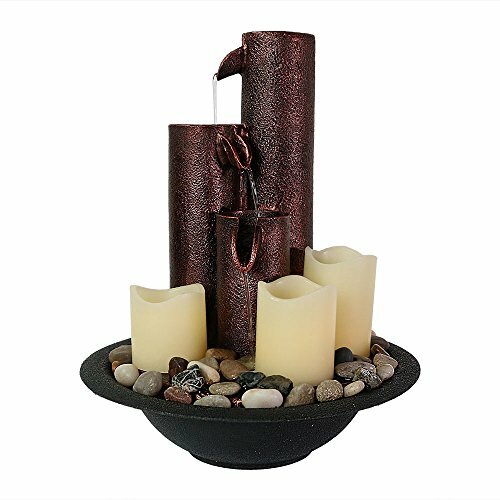 An ideal home decor gift, it is made from lightweight resin with an aged bronze/copper finish, and three tiered, spouted columns pass water down each tier of the fountain; the water recirculates with help from a quiet, submersible electric pump that sits in the round, black bowl. The LED lights under the three candle like pillars create a soothing soft ambiance to enjoy while reading a book or relaxing after a long day. . Enjoy soothing waterfall sounds in your home anytime with this tabletop water feature, also, perfect for a desktop. Overall dimensions: 9 inch diameter x 11 inches tall. Fountain weighs 2.2 pounds. This fountain is made from durable, lightweight textured resin material so you can easily move it from one location to another. Lights turn on automatically when pump is on. Plus, no plumbing is required, simply add water to the fountain and plug it into a standard electrical outlet. Fountain includes electric recirculating pump, soft white LED lights, decorative rocks, 3 LED candles to place over the lights and transformer that plugs into standard indoor electrical wall outlets so you have everything you need to run it right out of the box. *Colors may vary slightly from on-screen images.